We’ve infused our special occasion styles with the bright citrus colors, whimsical motifs and romantic blooms of the South. For budding big sisters we have a lovely Peach Flower Dress and a darling Eyelet Easy Fit Top with sweet butterfly back and matching Twirl Skirt. Both pair perfectly with a shiny pair of Old Soles or Livie & Luca sandals. Our blush pink flutter sleeve baby dress for little sis is fantastic for twirling and matches back to the lovely eyelet detailing and spring color palettes for big sister. For him, it’s all about classic charm. Choose from lots of options he can dress up yet are still comfy and durable enough to withstand his playtime adventures. One of our favorite dressy staples for spring is this Striped Short Sleeve Button Shirt. Its versatile stripes make it perfect for formal celebrations or casual backyard parties, and our plaid Twill Travel Shorts round out the outfit with a punch of colorful flair. 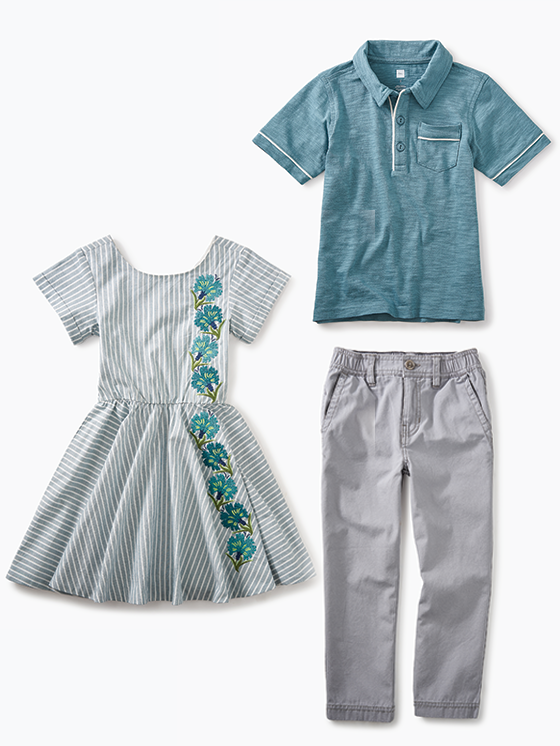 Get a matching set for his little sidekick or go with our Striped Polo Romper for something a little different but still complementary. When it comes to sharp dressing, there’s nothing more handsome than neutral, bluesy hues. Your little lady is sure to make a stunning statement in our fresh-for-spring Floral Embroidered Dress, topped off with an elegant ruffle trimmed cardigan and shiny silver sandals. Grab a matching set for baby sister too. Then get him ready to put on the charm in a soft jersey Piped Polo and storm grey, classic Canvas Chinos. If colorful and bold is more their style, we love these coordinating looks! Don’t forget to share your favorite spring party pics and sibling styles with us! Share on Instagram using the hashtag #TeaCollection.